[By Róisín Curé in the Algarve, Portugal] Last year I was invited to take part in the Sketch Tour Portugal, along with 23 other sketchers from Portugal and elsewhere. The trip was to take place before the start of the busy season, and I spent the third week of March there, returning last week. I was thrilled to be asked and the trip was everything and more than I had anticipated. Everything, because it was sunny and beautiful. More, because I could never have known how lovely the Portuguese people are - very laid-back and so warm. The food was excellent and tasted like the best home-cooked food that reminded me of some wonderful women cooks I've known - my mother, my friends' mothers, my friends. By that I mean there was no fuss, the food delicious and the smells heartwarming. The scenery was largely unspoilt and the coast was glorious, clean and fresh with a total absence of over-development. I loved my six days in Portugal and I would really like to spend more time there. 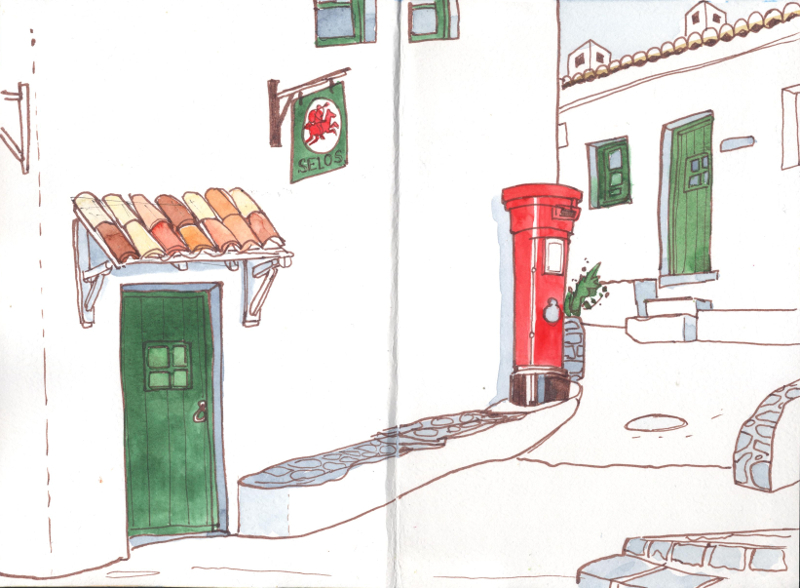 These sketches were made on the last day, in a tiny village called Pedralva, near the southwestern coast. I knew that the above sketch would be fast and easy: strong shapes, simple lines, large areas that I would not be painting at all. So it turned out. 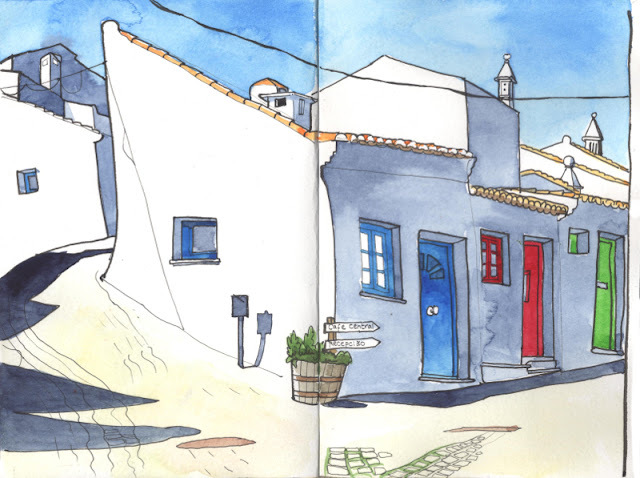 The second sketch was made at the other end of the village. It was almost the last sketch of the day: the sun was setting and it was getting cold. But I couldn't resist the combination of just two colours with a bit of terracotta thrown in for good measure. Pedralva has been restored from a dilapidated state to its current pristine incarnation, and now it is more or less a holiday village, quiet until Easter. I think I was lucky enough to catch a glimpse of what it must have been like many years ago, before poverty hit the village, before it fell to rack and ruin. It's great to see a beautiful place like this thriving and occupied again.